a. 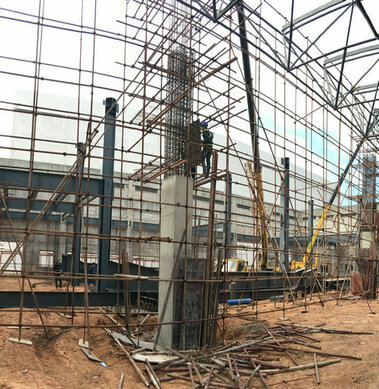 The detection and calculation of steel structure member bar slenderness ratio, could according to section 6.4 of the test bar size, should be based on the actual size of the slenderness ratio accounting bar. b. The connection of steel structure support system, can be detected according to the provisions of section 6.3 of this chapter; size of support system component, can section 6.4 of the determination; should be verified or evaluated according to design drawings and corresponding design specifications. c. The steel structure section thickness ratio, according to the provisions of section 6.4 of this chapter was related to the size of the component section, and accounting, was evaluated according to the design drawings and related specifications. a. The quality of protective coatings for steel structures building should be checked according to the relevant national product standards. b. The grade of derusting on the surface of steel can be determined by the contrast observation of the picture stipulated by the national standard "the rust grade and rust grade of steel surface before coating" GB8923. The film thickness could be detected by Quj, sampling quantity of components should not be less than the minimum capacity of the standard table in 3.3.13 class, also should not be less than 3; and each measuring 5, each value is the average value of the dry film thickness of 3 50mm apart from the measuring point. The coating thickness of thin fireproof coating can be measured by coating thickness tester, and the measurement method should be in accordance with the CECS24 specification for application of fire retardant coatings for steel structures. The thickness of thick fireproof coating should be used to probe and detection method for measuring ruler, the provisions shall be in accordance with the "Regulations" application technology of fire retardant coatings for steel structure CECS24. The thickness value and deviation value of the coating shall be evaluated according to the code for acceptance of construction quality of steel structure GB50205. The appearance quality of 6.7.4 coating can be tested and evaluated according to different materials according to the code for construction quality acceptance of steel structure GB50205.